The Rutledge Agency sponsored a giving campaign to benefit the Guadalupe Clinic last July. Every time a person received a quote, Rutledge Agency offered to give to the Clinic. The Rutledge Agency’s initiative was a valuable contribution to Guadalupe Clinic, which has provided quality healthcare to the uninsured in Wichita and surrounding areas for more than thirty years and is supported by the generosity and good will from donors of time, talent, and treasure who make this mission possible. An estimated 70,000 people in the community lack health care coverage today. 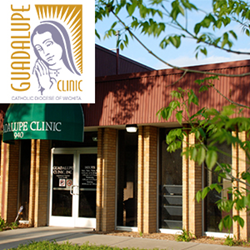 Guadalupe Clinic is dedicated to serving those families. The organization believes no one should have to choose between feeding their family or seeing the doctor. Thanks to partners like the Rutledge Allstate Agency, community members were asked if they’d like a policy review in exchange for a $20 donation to the Clinic. A $5-dollar contribution is always asked of patients as well, however no one is turned away if they are unable to donate. “We’re thrilled to work with the clinic to really help change our community for the better,” said Devon Rutledge, The Rutledge Agency Principal. “Anyone who called our agency to receive an insurance quote helped the Clinic get another $20, at a minimum,” announced Devon Rutledge, the Rutledge Agency Principal. “Thanks to the stewardship of The Rutledge Agency in donating to Guadalupe Clinic, we can continue our 33 year tradition of providing quality medical care for a $5 donation and if individuals don’t have their donation, we still care for them, no one is turned away,” stated David Gear, Executive Director of Guadalupe Clinic. “We are so thankful for the vision and community leadership of Rutledge Agency. We are only able to serve so many in our community thanks to the corporate partnerships that so generously support our mission to serve the uninsured in Wichita. Devon Rutledge is a great example of socially responsible business leadership in Wichita, we are greatly appreciative of his support of the Guadalupe Clinic,” said Andrie Krahl, Marketing and Development Director, Guadalupe Clinic. Guadalupe Clinic opened in 1985. Over 300 active volunteer medical professionals provide services to the uninsured.